Picture of: Liz Weir during the recording of the next Storyteller.net Amphitheater. (Photo by Mark Goldstein-ty Mark.). 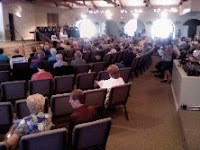 Picture of: the inside of "The Fountains: A United Methodist Church" celebrating their 20th anniversary, where I was one of the guest speakers. Today I: made that long drive from my house in Avondale to Fountain Hills, AZ; presented a couple of stories for their service today- once upon a time, more than a dozen years ago, I was the storyteller part of a regular, weekly, creative, artsy, cutting-edge gathering there; came home and took a nap after all the previous night's partying prep and today's events; worked on some storytellingproducts.com orders; can't find my GTD book; had an evening staff meeting and dinner; prepped for my meeting tomorrow with Liz and Liz; put some more energy into the CD recording workshop. 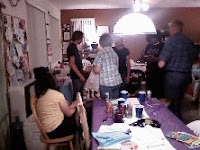 Picture of: 8 of the 30 people we crammed into our house tonight for my parent's 45th anniversary (also sister #1's ?? birthday and daughter #1's 18th birthday) party. 03.28.2008 Friday: Just Five a Day?? 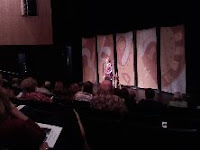 Picture of: wide view of the theater tonight for Liz Weir's storytelling concert at South Mountain Community College Spring Festival. Picture looked much better on the phone screen, lol. Today I: spent time talking about goals and needs with a new corporate client; got a rental car to cover while van in the shop; took my van and its bad brakes, bad undercarriage bad blah blah blah into the dealer for service; picked up my lost and found cell phone from SMCC office; spent time on the phone with my core faculty advisor; had second phone meeting with corporate client- I love learning new things with people and hearing them learn; spent much phone time with a peer in the biz talking about possibilities, hold backs, value and on and on; dealt with catering order for huge family party tomorrow; spoke with another local client who thinks artists are booked by the hour. explained how one hour of performance takes up to three hours of support; spoke to my brothers both #1 and #2 and sister #1; resolved billing issue with hotel regarding presenter's room; communicated with school regarding my upcoming "substitute teacher" gig for college class; prepped my presentation for Sunday morning event; answered Emails about an October event; picked up car from dealer and paid with a pound of flesh, a pint of my own blood and my first born child's future earnings; had lunch with my kids; went to SMCC for the Liz Weir concert- great evening; spoke with storytellers Dustin, Elly, Sandy, Liz, Mark, LynnAnn, Loren, Don, the other Liz; restarted my 43 folders; added yet another topic to my "blog and write" list. Picture of: g-rated version what I said today when I realized I lost my new cell phone, the one that I take pictures with. 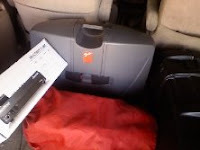 Picture of: my van loaded with equipment for the school show today. 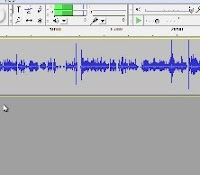 Picture of: screenshot from my audio editing software I used all day today. 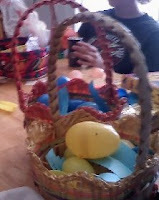 Picture of: a wee basket of plastic eggs. Picture of: Steve Ferreira's work on the drum today during the workshop I attended. Today I: worked on flyers for copies; went to breakfast with the whole family to celebrate my daughter #1's 18th birthday; made copies at Kinko's- found typo as I was printing. That is pretty darn rare; made a run to the post office- found check in the mail- yay; went to a great workshop on spoken word and storytelling with Steve and Resa who spoke at SMCC's Storytelling Institute today; prepped envelopes for mailing; sent orders to storytellers who sold CD's today from storytellingproducts.com; continued to watch the interactions of enabling behaviors in the storytelling world. Sigh. 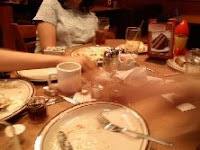 Today's Bonus Picture of: the end of the breakfast meal where many hands were moving so fast over the plates. To hang stars upon tonight." 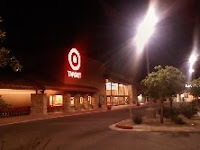 Picture of: the local "durable goods" store where I found some really really good containers for storing PR materials. Today I: sent a whole bunch of purge notices to Storyteller.net members; watched yet another person take a storytelling hit; gave away too much free coaching; dumped a lot of old stuff into archive storage finally; secured some travel plans for Gatlinburg in September, now I have to decide on August; started a new one-sheet for educators; caught up with yet another friend who I haven't spoken with in a while- lunch in April, yay; went shopping for organizer containers, per the picture. 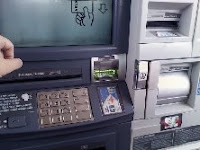 Picture of: the ATM machine at a my local bank branch. Picture of: a cupcake with green sprinkles and serving of my potato soup. 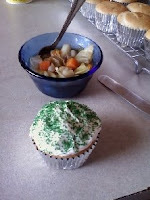 Today I: "got things done"; worked on the St Pat's day podcast and somehow ended up with a bug that wouldn't let me post it- sigh- it will be up on Tuesday; otherwise laid low today and made Irish dinner for my family, feeding them potato soup, fancy cupcakes and Culcannon, which daughter #3 refers to as (say it like a leprechaun) "fiddlelee dee potatoes"; passed out green cupcakes to various family members; tried to figure out what I am supposed to be doing for the school class I am taking. Sigh, I really don't need to learn how to appreciate classic literature...again. Picture of: storyteller Liz Warren telling at our monthly Storyteller.net at Borders event tonight. Today I: prepped for tonight' event; changed the recording process for future events; finished the flyer for the "Make Your Best CD" course; MC'd and told at the gathering along with some very talented people such as Liz Warren, Doug Bland and Carol Knarr; bad FMS fog today and yet I managed to get through the first 10 minutes of the Battle of the Wrens including the bashing of brains on rocks --ahh, I love fairytales. I am sure this evening's stories will be this month's podcast. Well done, my friends; heard from a graduate of the Outside In Marketing Camp and how she got published in an out of state paper about her out of state road tour. The stuff of the OISBC works. Come. 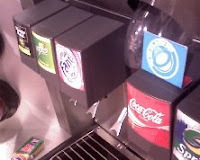 Picture of: the soda fountain at my local convenience/gasoline/hotdogs place. Between needing soda/gas/hotdogs, I am in one of these places almost everyday for one of those three. Lately, mostly gas. Today I: finished up lots of loose ends in the Storytellingproducts.com online store- still some things to do; "got things done'; sent tons of Email; finished more things for school; did the initial edits for some sound files from Tim Ereneta's appearance at our festival back in January; finally got the caterer menu for our next live events- these events are not cheap to produce; mailed thank you notes to sponsors; watched my daughter #1 buy herself her 18th bday present- picture tomorrow if the alpha dogs don't eat it first; Twittered; thought long and hard that "power is taken not given." 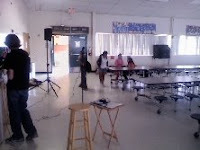 Picture of: setting up the room and kids trickling in for the school shows I did today. My roadie, aka Daughter #1, is on the left. 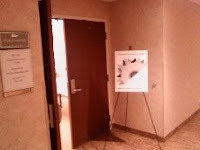 Picture of: the signage outside the door to the Arizona Storytelling Guild meeting, meeting held tonight. Today I: did a bunch of 10 minute cleanings; sent invoices for previous storyteller events; wrote new flyers for upcoming events; secured room space for said events; planned out two CD playlists; "yes, I do know that it was an attempt to get me to be quiet"; debated with myself about visibility; talked with a Subway owner about why wi-fi makes me choose one restaurant over another, led and participated in the AzSG meeting where we introduced the new "Outside In Coaching Method"; ate dinner with my wife late night. 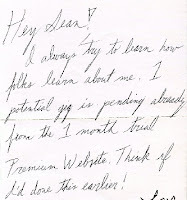 Picture of: scan from a thank you note I got from a directory member listed at Storyteller.net. "Hey Sean, I always try to learn how folks learn about me. 1 potential gig is pending already from the 1 month trial premium website. Think if I'd done this earlier." Storyteller.net directory listings work. Today I: went to the PO Box to clear out mail from the last several days and found this note and the Storytelling magazine with my article that Priscilla sent to me; updated storyteller.net pages, worked on my "getting things done" notebook; had my Monday morning staff meeting on Sunday night; was again reminded that "if you aren't listed on Storyteller.net, you are missing bookings, period." 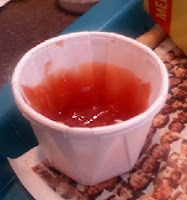 Picture of: little paper cup of ketchup (catsup?) on the tray as I ate lunch with my kids today. We all agreed that ketchup is best served in these little cups. It tastes better. Today I: thought I better let you know that I am still here, just not feeling up to par and caught up in a whole restructuring process right now; reading Email floating around that question my sanity, lol; I am here. I am storytelling. I am a storyteller. Updates will resume shortly. 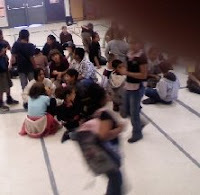 Picture of: kids leaving at the end of the school show I did today. Yes, that is my finger in the top right corner. Thank you. Please stop applauding and laughing at the storyteller. Today I: whew! Did a tough storyteller school show and then so many other planning and producing things that I am fried. Going to bed, my FMS is winning today and some days that is just the way it is. I will try to write more accurately on Thursday. Picture of: two Arizona automobile license plates. One reads STORY and one reads TELLER. Aww, how precious. We finally got them (I'm Teller) lined up at the OISBC camp last week. Today I: reworked the schedule for the Outside In Camp and found a way to add even more content; got some great books from Margaret Read MacDonald today- I love it when when she autographs the books she sends me; did a lot of work on the website for the marketing camp- most of it is done with the new information and we are ready for booking the August event; wrote a blog post about the cost of our Storyteller.net Live events; posted the comments from the camp; negotiated with an Arizona hotel for the Recording Workshop and the OISBC this summer; had lunch with my kids; made a commitment to tell at the South Mountain Spring Festival; tried to fend off my FMS exhaustion; talked with another podcaster about his work; discovered another podcaster doesn't understand about the real nature of Storyteller.net and what I do; posted the Storyteller.net mission statement on the Storyteller.net website. 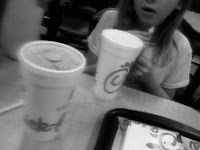 Picture of: my kids eating dinner out with my wife and I tonight. Today I: was in a fog and trying to recover from one great storytelling Marketing camp event. Organizing and presenting a first-time, multi-day event is so much work. Someone wrote me and said, "This was a mind altering event for me." Wow. It was worth it. Goodnight.